For courses in Developmental Writing. 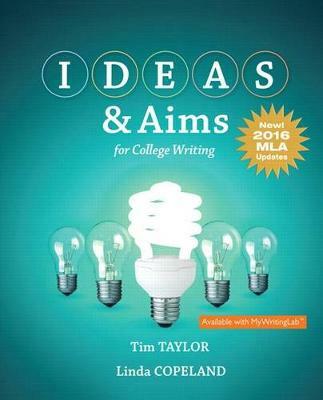 IDEAS and Aims fulfills a growing need in classrooms for a more contemporary approach, and a different type of writing textbook specifically developed with course redesign in mind. Its consistent focus on subject, purpose, audience, and genre leads students to effectively analyze the writing situations they will encounter in their college courses and in their everyday lives. This is accomplished through the use of an easy to remember template tool called IDEAS (Interest, Details, Explanation, Audience, and Style) that helps students see writing not only as an important academic and lifelong skill. *The 8th edition introduces sweeping changes to the philosophy and details of MLA works cited entries. Responding to the increasing mobility of texts, MLA now encourages writers to focus on the process of crafting the citation, beginning with the same questions for any source. These changes, then, align with current best practices in the teaching of writing which privilege inquiry and critical thinking over rote recall and rule-following.